Partners that help MHC bring quality healthcare to the community. First 5 California was created by voters under Proposition 10 to recognize that children's health and education are top priorities, especially in the early years of development. Research shows 90 percent of a child's brain develops in the first five years of life. Making those years count is what First 5 California is all about. Since 1998, First 5 California has invested millions of dollars to design comprehensive programs that address the needs of children ages 0 to 5 and their families. With statewide partners in each county, such as First 5 Siskiyou, they ensure that their programs are reaching the children and families that need it the most so that they enter school healthy and ready to learn. Covered California is where Californians can get brand-name health insurance under the Patient Protection and Affordable Care Act. 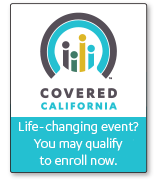 You may qualify for a discount on private insurance or get health insurance through the state’s Medi-Cal program. Covered California helps Californians buy low-cost coverage from top-quality health plans. Our health centers have a certified enrollment counselor on staff to provide information and enrollment assistance for Covered California and Medi-Cal. Please contact us for more information.